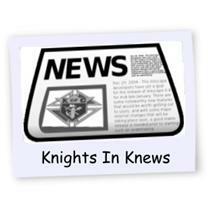 This is an album of local Knights in the News! Cardinal Theodore McCarrick, Archbishop Emeritus of Washington D.C., 81, speaks at St. Michael's Roman Catholic Church on March 8. Parishoners young and old filled the pews at St. Micael's Roman Catholic Church in Cobourg to hear His Eminence Cardinal Theodore McCarrick speak. His Eminence Theodore McCarrick speaks to the congregationat St. Michael's Roman Catholic Church yesterday, much to the obvious enjoyment of the church's assistant Pastor, Fr. Mario Avila (left) and Pastor, Fr. Andrew Ayala. McCarrick is one of only 213 Roman Catholic Cardinals in the world.